NETGEAR network-attached storage of the ReadyNAS series has already been tested in our laboratory, but the model ReadyNAS 2100 is a rack mountable one. It has four disks and is aimed at a different market segment. Let's see with what the producer has managed to stuff such a small, for this sort of devices, case. NETGEAR ReadyNAS 2100 is produced in five different configurations: RNRX4450 is equipped with four 500 Gbytes disks, RNRX4410 with 1 Tbyte, RNRX4420 with 2 TBytes and RNRX4430 with 3 Tbytes, while RNRX4000 is supplied without disks. Some models can be unavailable in some countries. In our laboratory we've got RNRX4410 storage and it is what we are going to describe in this article. The size of ReadyNAS 2100 metal case without brackets is 430*318*43mm (width*depth*height), that is far less than the size of one 1U rack-mount storage we have already tested. The weight of this case together with disks is only 9.5 kg. Its size and weight lets the storage being attached to the rack just by using the brackets, placed near the front panel of the storage. It must be mentioned that this ability is typical only for the model ReadyNAS 2100, as the elder versions of NETGEAR rack storages are equipped with the special rails for rack-mounting. The front part of the ReadyNAS 2100 has four slots for mounting baskets with hard drives, as well as LEDs for USB and Gigabit Ethernet connection, disks activity and the device itself, and an indicator of the storage power status. On the front panel you will find three buttons for backup, system reset (sys) and power. Moreover here is a vent grid for storage extra cooling, USB 2.0 and a sign with the information about the producer and the device model. There is nothing special about the side panel and the bottom. On the top plate of ReadyNAS 2100 there's a sticker with the info about the vendor, the model, the serial number and the device MAC-addresses, the needed power and the initial device settings. On the rear side of the tested device there are six vents 40*40 mm, the power enter with a switch, two USB 2.0 ports and two GE-ports (installation of an additional 10GE net card is not provided), and a sunk console for being used only by the vendor's service engineers. NETGEAR gives a five-year warranty to the storage ReadyNAS 2100. Now let's have a look inside. 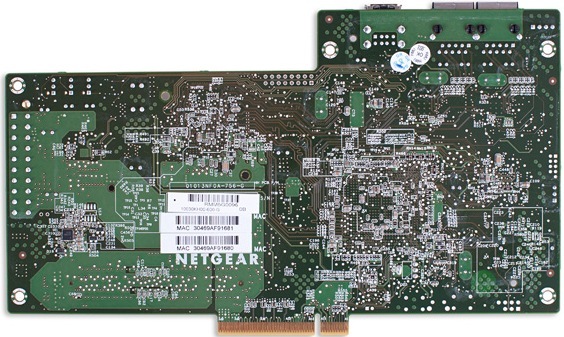 Inside NETGEAR ReadyNAS 2100 is divided into two unequal parts: in front there are disk bays, whereas the entire computing capacity is situated in the back. The power supply and the motherboard, the main elements of which are place only on one of the sides, can be easily dismounted for diagnostic or change. Three groups of doubled vents can also be found on the portable module. The power unit model is FSP220-60LE of FSP company. The motherboard's vendor is FOXCONN. RAM is presented by the module Apacer 1GB SOD PC2-6400 CL6, built on the eight Hynix chips HY5PS1G831C. 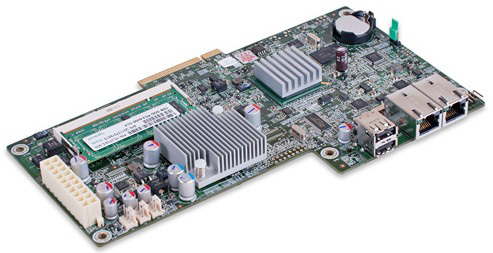 ReadyNAS 2100 is made on the base of Intel CPU Atom D510, working with the frequency of 1.66 GHz. 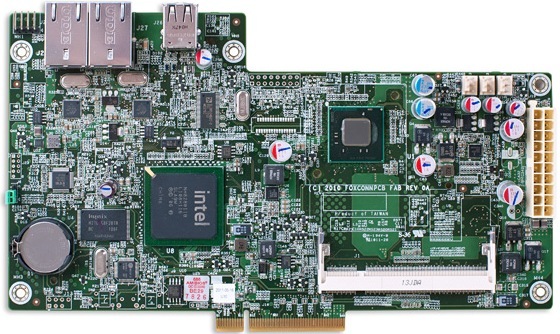 The south bridge functions are performed by Intel NH82801IB. The input/output operations are generated also by ITE IT8758E. The flash-memory is represented by a Hynix chip H27U1G8F2BTR-BC, with volume of 128 Mbytes. The work with the net is provided by two Marvell 88E8057 controllers. On the board there is a frequency generator by Silicon Labs SL28504BZC. That leads us to the end of the ReadyNAS 2100 hardware platform review. Let's move on to the program features. NETGEAR ReadyNAS 2100 network attached storage is shipped being absolutely ready to work, you only need to connect it to the existing net infrastructure. 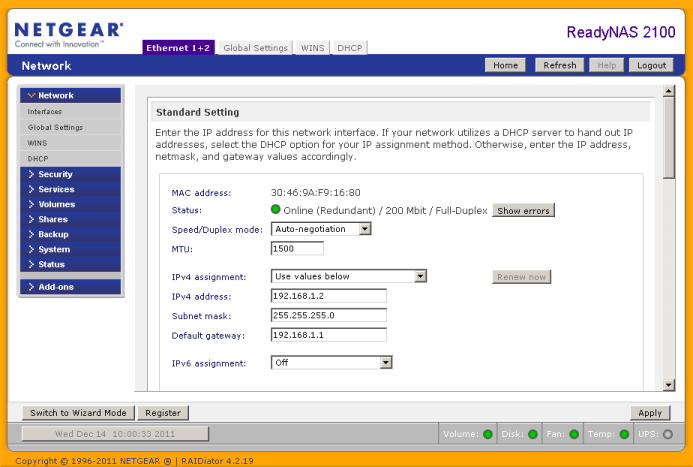 If there is a DHCP server in the net, the device automatically gets all the necessary settings. 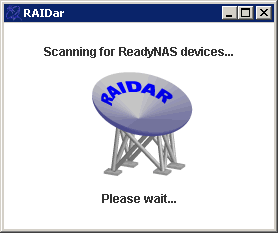 If there is no such a server, ReadyNAS 2100 uses the preliminary configured IP-address - 192.168.168.168/24, that can be addressed with the help of a browser. To search for the storage in the net's local segment a special utility NETGEAR RAIDar can be used. Its installation is performed in a way usual for Windows users and doesn't need any qualification. Just after the installation the utility can be launched and the search of the NAS may be started. 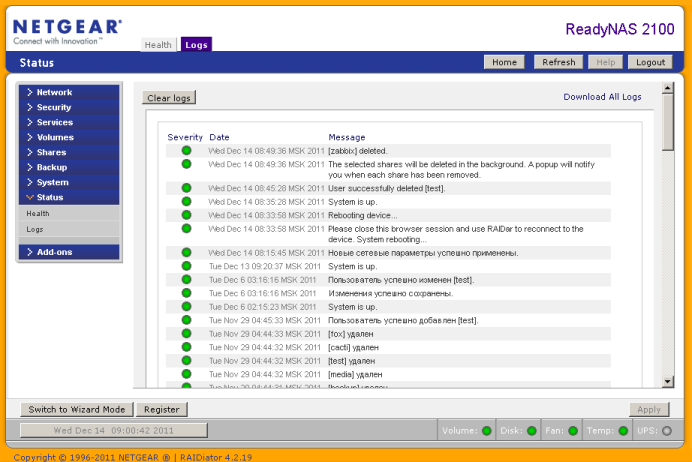 All the detected devices and brief information about them are given as a list in the main window of the program. 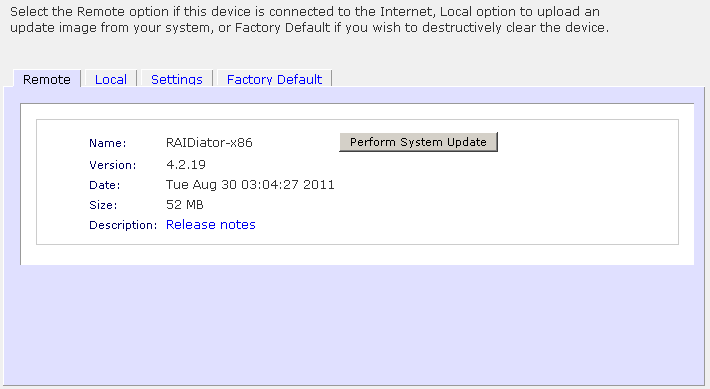 Unfortunately, the utility RAIDar hasn't got a Russian interface. An administrator can also use RAIDar to fulfill some specific tasks, for example, the change of the RAID-array type from X-RAID2 into a usual RAID0,1,5,10 (FLEX_RAID) can't be performed by a web-interface, so the use of RAIDar is urgent in this case. Let's give a detailed description of the transition procedure. Firstly, it's crucial to reset all the settings of the storage to default, that can be performed via the «Factory default» tab of the «Update» item in the «System» group of the web-interface menu. 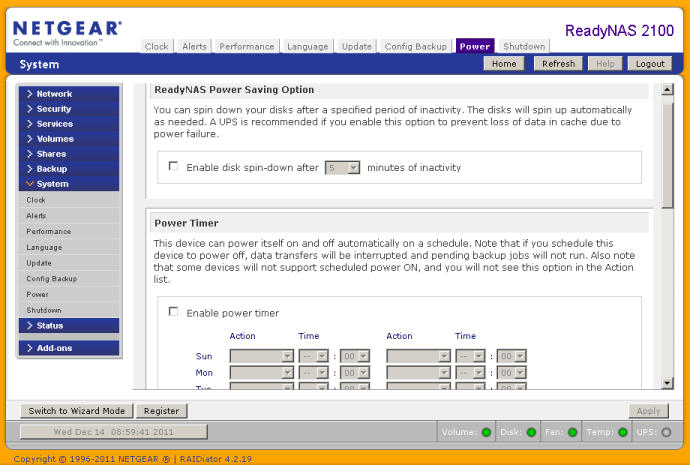 Than, immediately after reboot, ReadyNAS 2100 checks all the installed hard drives and initializes the hardware platform. 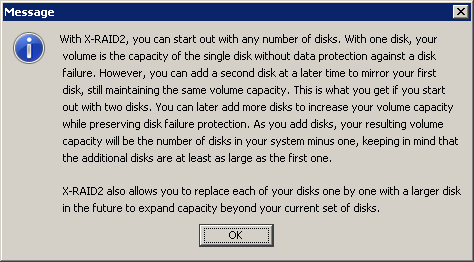 Then during ten minutes you must start configuring the storage and specify the appropriate RAID-array type. The array creation is a time-consuming process that will take you some hours depending on the installed hard drives and the preferred array type. 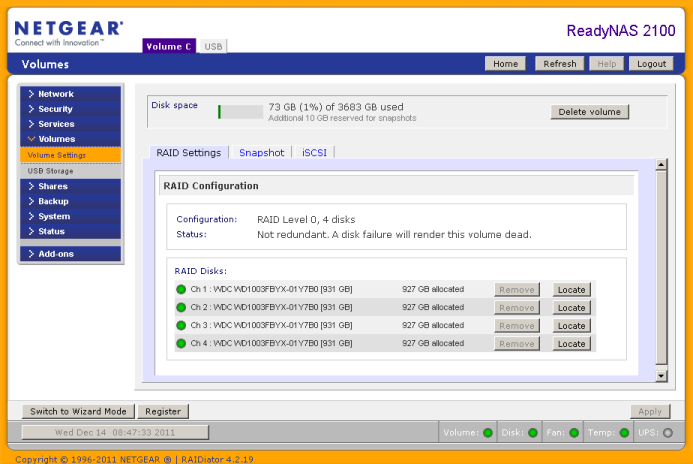 Let's take a closer look at the unique for the NETGEAR NAS type of arrays – X-RAID2 that allows expanding the volumes automatically considering the installed hard drives. For the array to work properly the media of different kinds can be used. This finishes the major part of the storage work preparation. 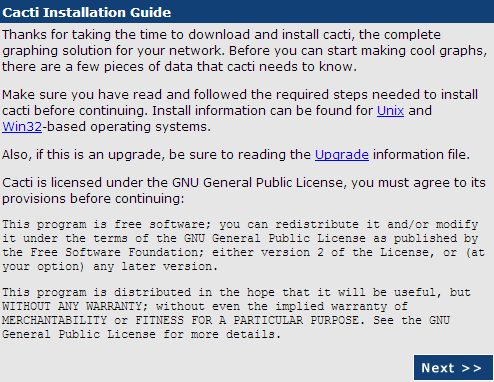 It's not necessary but it is strictly recommended to upgrade the firmware to the latest stable version. 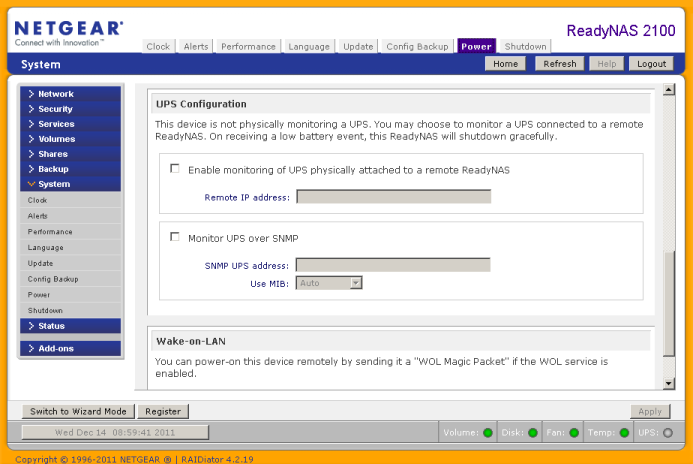 The change of the firmware is possible either via a web-interface or through the special managing system NMS200, which we have spoken about in the WNAP320 access point review, therefore now we will go into the details of upgrade via the web-interface, to perform which one must address to the «Update» item of the «System» menu group. The update process can be performed manually or in semi-automatic mode. For the semi-automatic mode you must be connected to the global net. 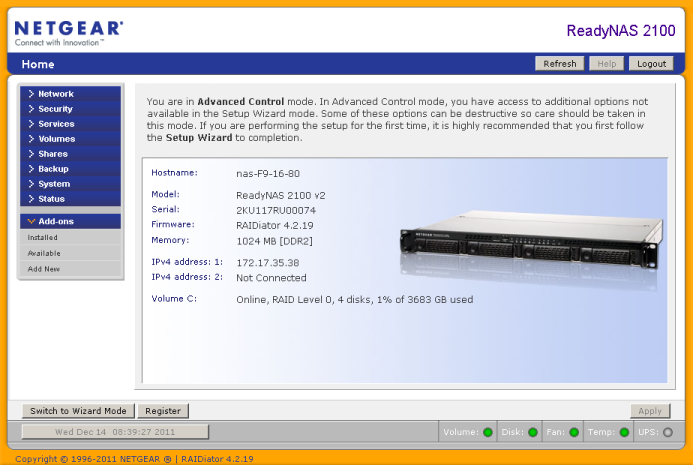 ReadyNAS 2100 will connect to the vendors' servers automatically and download the latest firmware version, you will just need to click the button «Perform System Update». 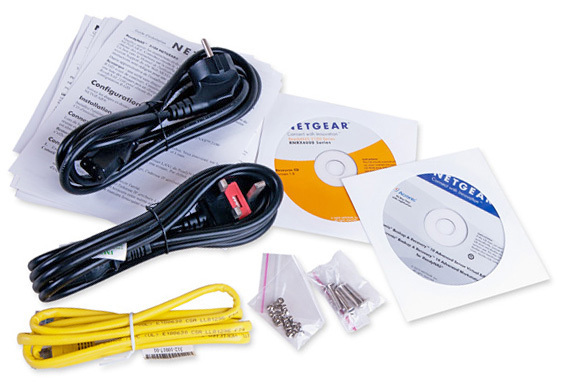 The manual mode is not much harder – the administrator will have to get the firmware from the NETGEAR site and upload it into the storage. The whole update process takes not more than three minutes. The installation of the add-ons is also possible in the manual or semi-automatic modes via the items of the «Add-ons» group of the web-interface menu. It only must be mentioned that in the semi-automatic mode the user can get only the modules produced by the NETGEAR company. To install some different add-ons there is an «Add new» item in which the administrator must choose a file with the previously downloaded module and begin the installation. After the installation of some add-ons you may need to reboot the storage. 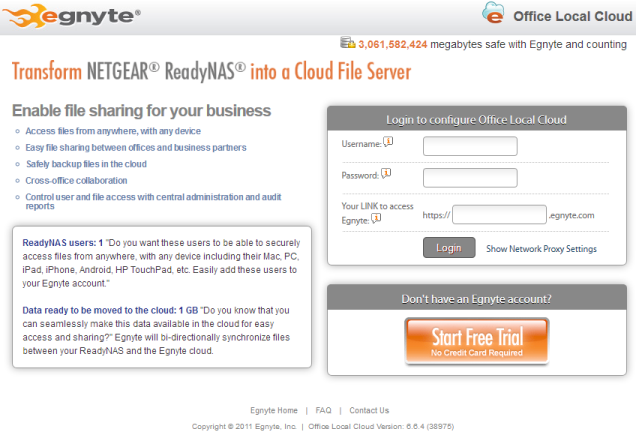 One of the new and interesting modules, in our opinion, made by NETGEAR, is Egnyte Cloud File Server. This add-on allows connecting the net storage ReadyNAS 2100 to the file servers in Egnyte cloud. Such connection provides the synchronization of the files between the local storage and the cloud servers. Staying at the office a user can get access to the files at the speed of the environment, afterwards these files will be synchronized with the cloud files that will give this user an opportunity to continue his work with them at home or in a business-trip. Egnyte Cloud File Server Module can be especially helpful when the remote connections to the inner servers of the company are restricted by the net security policy, or when it is essential to have a backup of the crucial data on-line. Apparently, it suits only in case if the company security policy permits to entrust the store of your data to the third-part company. We would like to note that at the moment of creating this article there were no add-ons supporting the work with IP-cameras or USB-cameras. The only variant of this storage and some camera interoperation is when the camera supports the opportunity to store photo- and video files on the remote file server. The example of such camera is our lately tested model ACTi TCM-5611. Now let's turn to the examination of the web-interface functions. 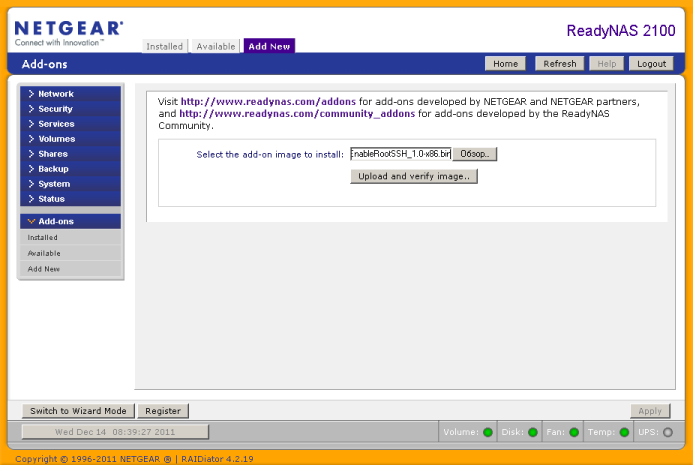 The ReadyNAS 2100 web-interface looks like the one we've already seen in another NAS by NETGEAR – ReadyNAS Ultra 2 Plus, that's why we won't describe all the points in detail, but look at the most interesting ones in our point of view. 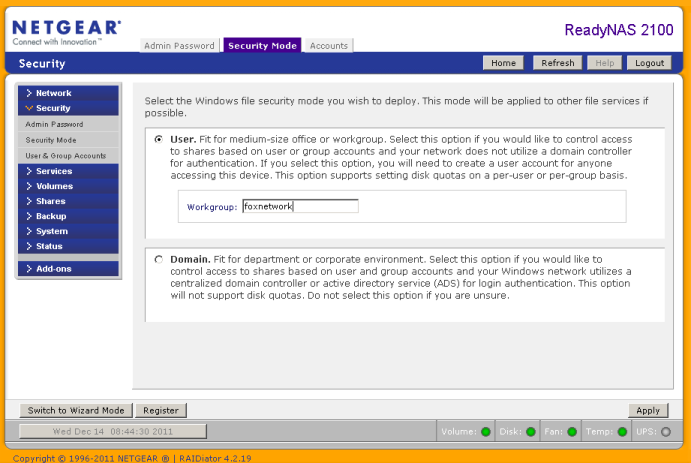 Login and password by default are admin and netgear1, correspondingly. 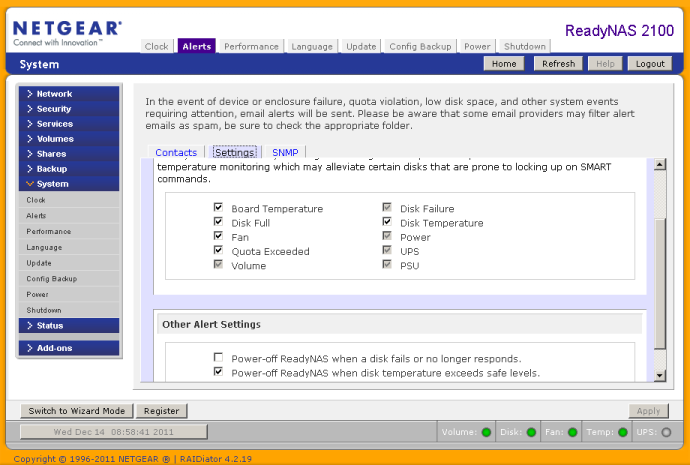 Once the correct logon information is typed in, the user finds himself on the homepage of the storage, where the brief information about the device is given: the host name and model, the software version and the RAM capacity, interface IP-addresses and some data about the created volume, temperature and vent's work. 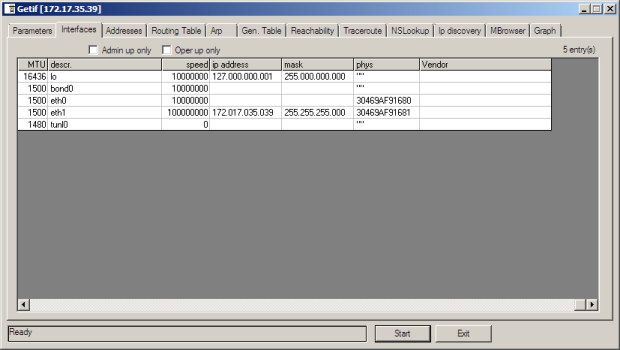 The «Network» group contains the tabs that allow controlling the parameters of the net interfaces. 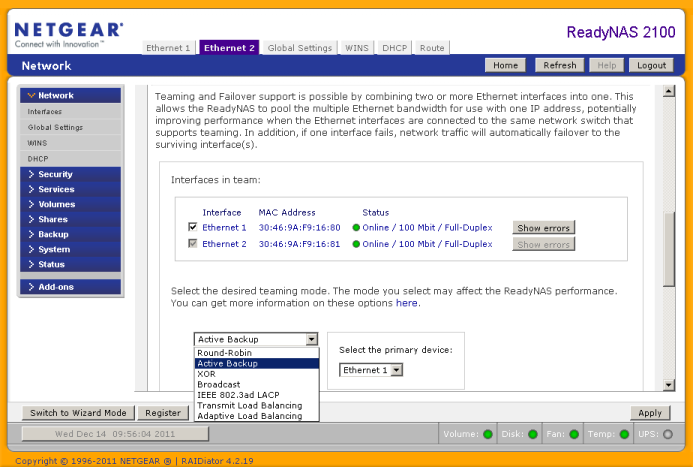 Here the administrator can assign the addresses for IPv4 and IPv6 protocols, the speed and the duplex. More than this, there's an opportunity to combine both of the interfaces into a group, to take the protocol 802.1q into account and to enable jumbo-frames. 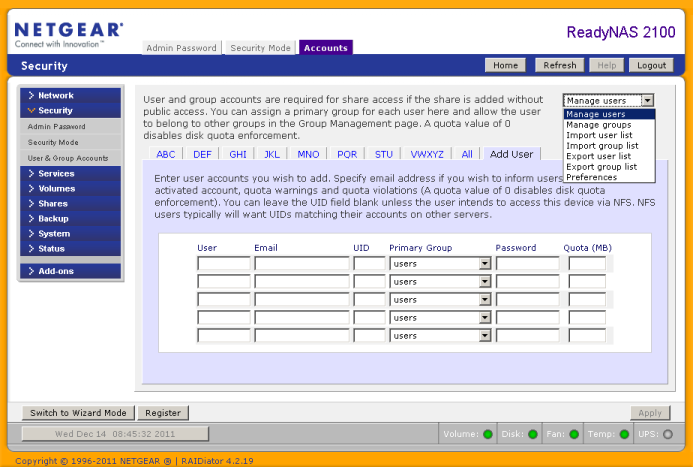 In the sections of the «Security» group there are all the configurations referring to the managing of users and groups. 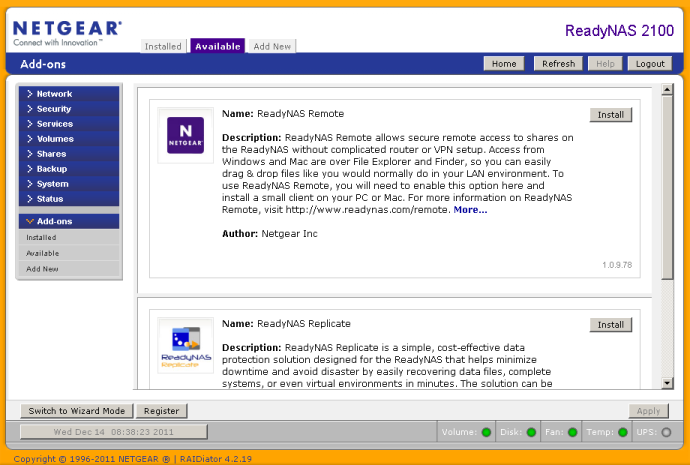 NETGEAR ReadyNAS 2100 lets functioning either in the workgroup or as a member of the Windows domain (ADS). Managing of the standard file protocols (CIFS, NFS, AFP, FTP, HTTP, HTTPS and Rsync) and the means of detecting the services on the net (Bonjour and UPnP) happens with the help of the sections in the «Services» group of the menu. The sections of the «Volumes» group are created to manage the volumes on the RAID-array and USB-drivers, snapshots and iSCSI. Managing the shares and their creating take place in the «Shares» group. 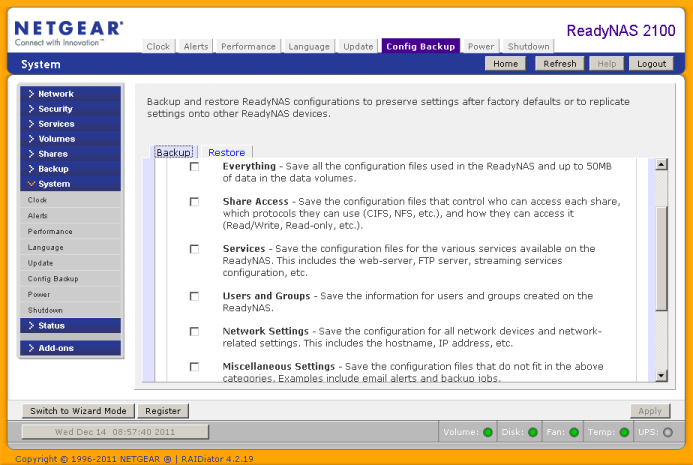 Backup configuration is performed in the «Backup» menu group. Copying can be fulfilled into some remote storage via the protocols SMB, FTP, NFS, Rsync and to a USB-drive, or in the opposite direction. 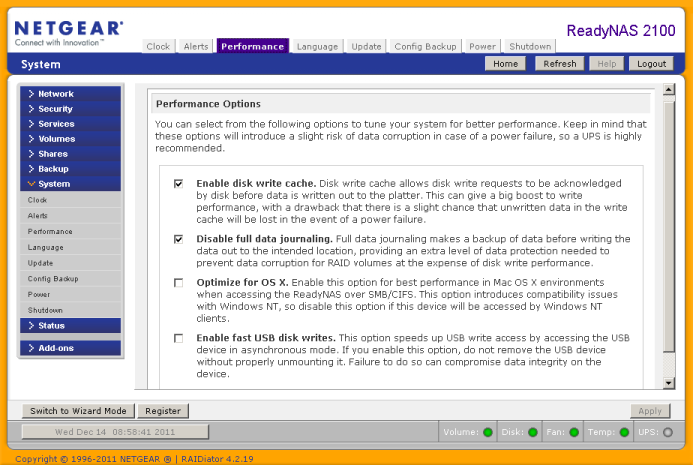 Moreover it is possible to work with Time Machine and ReadyNAS Vault. 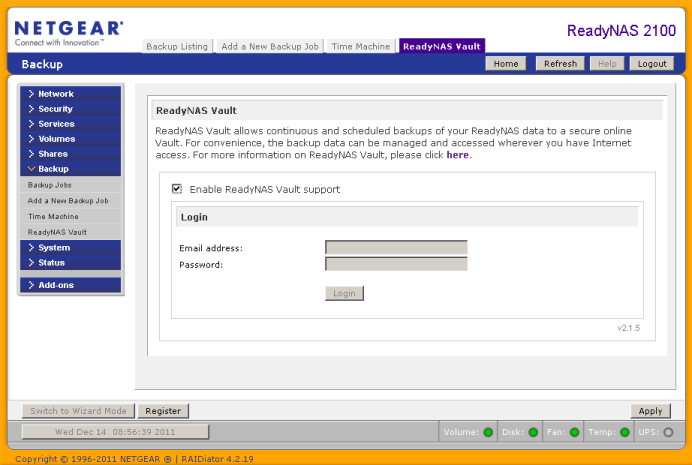 With the help of ReadyNAS Vault the administrator can create backups in on-line vaults that allow restoring the data even after the total destruction of the DPC where the device was placed. It is also important that the users of ReadyNAS 2100 have a chance to perform the backup in on-line storages by using an additional module Egnyte Cloud File Server that was described in the previous part of the review. 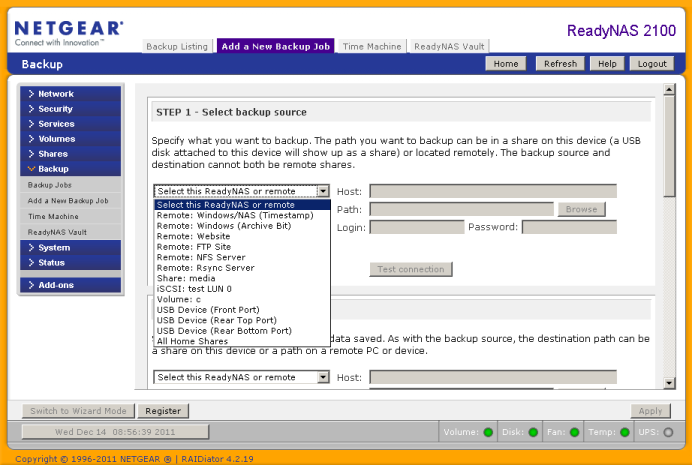 The «Backup» group is used to backup the users' data, but the creation of the system configuration copies, services, network parameters, etc. is performed by the «Config backup» itemof the «System» group. 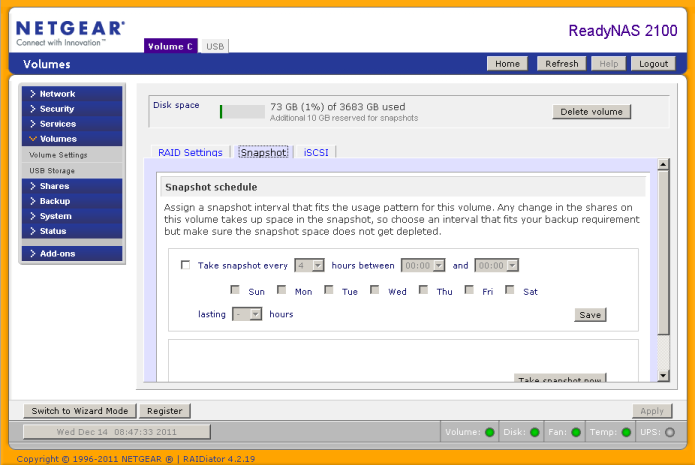 Unfortunately, there is no way to organize an instant backup of the storage itself via ReadyNAS 2100. Now let's address some other points of the «System» group. 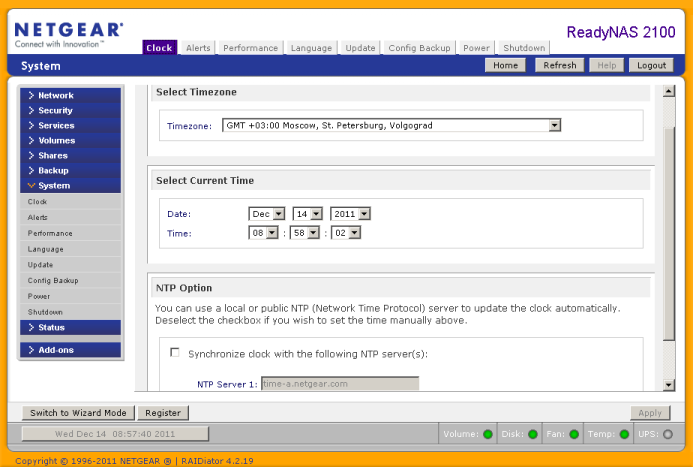 Using the «Clock» section the administrator can select the time zone where the equipment is placed, set the current time and date and manage the synchronization with the outer NTP-servers. Unfortunately the current firmware version 4.2.19 doesn't allow selecting the NTP-server with a Cyrillic name, that's why synchronization with a server like время.провайдер.рф is impossible. Furthermore, in the mentioned firmware the latest amendments of the Russian Federation Government, connected with the abolished time shift between the winter and summer seasons are not taken into account that is the time zone Moscow +4 hours is missing. The notification sending parameters via e-mail and SNMP are gathered in the tabs of the «Alerts» section. 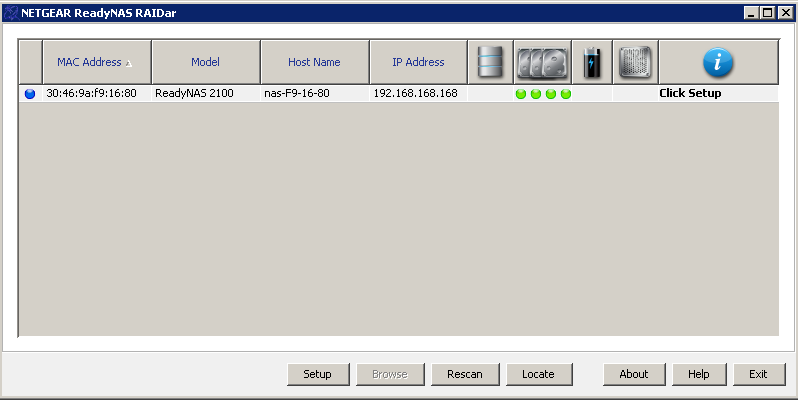 You can enable the SNMP-access here as well. By means of the «Performance» item the administrator can control disk write cache, operation data journaling and enable USB disk writes in asynchronous mode. 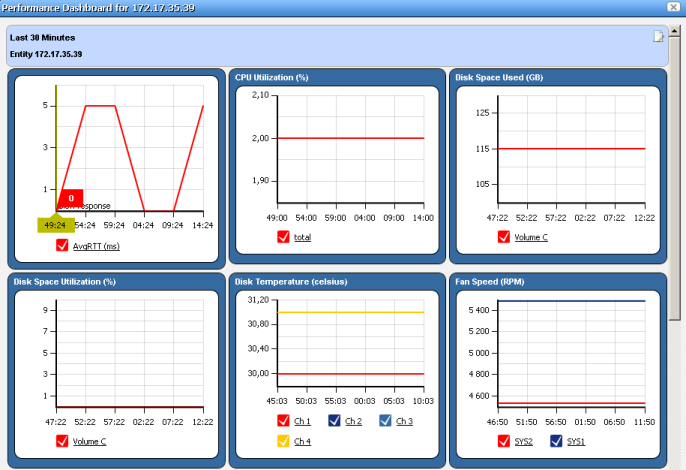 The configuration of power management functions is performed in the «Power» and «Shutdown» items. The last group we haven't reviewed yet is the «Status» group, with the help of which the administrator can look through the health of all storage parts and get some log information. Now the interface review comes to its end and we are going to connect our device via the command line. 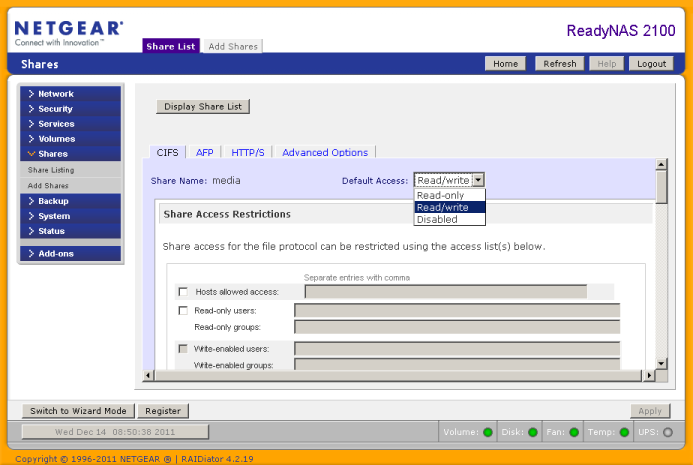 The access to the ReadyNAS 2100 command line can be gotten with the help of a special add-on «Enable Root SSH Access» that has to be installed in the «Add New» section of the «Add-ons» group in the web-interface menu. We connected to the storage according to the protocol SSH via the utility PuTTY version 0.6, though any of the SSH-clients can work here. The login is «root», and the password is the same as one for the user «admin» in the web-interface. This time we won't look into the command line interface features, but we will scrutinize into the most interesting ones. After the correct authentication the user will get into the command line of Linux 2.6.37.6.RNx86_64.2.1 operating system with the available library BusyBox 1.18.4. Let's see what processes are launched on this new device. We decided to create a separate file with the list of catalogue files /bin, /sbin, /usr/bin and /usr/sbin in order not to overload the review. Let's go to the catalogue /proc and see what files are located here , and find out the uptime of the operating system and its average load, get the information about the installed CPU and RAM capacity.The CPU cores 1-3 data we have deleted from the command cat cpuinfo output since it totally repeats the data for the core 0. You can get the list of all supported file systems and crypt types through the files /proc/filesystems and /proc/crypto. That is the end of our review of the command line. Now it's time to get acquainted with the SNMP-interface features. 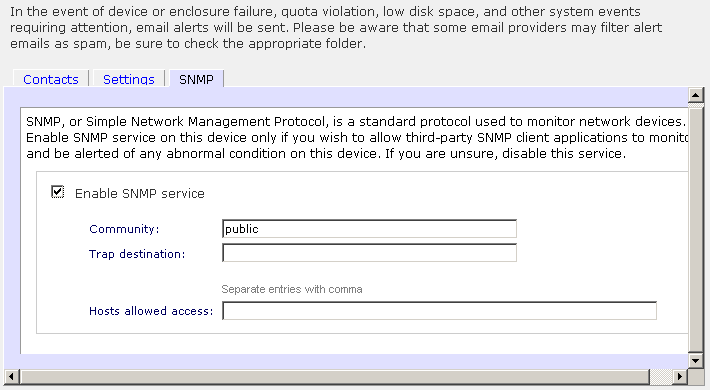 To get the access to the storage via the SNMP there is no add-on needed, you will just have to allow the according access in the SNMP tab of the «Alerts» section in the «System» group of the web interface menu and to point out the community name and give the allowed addresses. One of the simplest, in our opinion, utilities to get any data via the SNMP is Getif which can help to display the interfaces list, the routing table, the ARP-table, and to look through and to change all the available parameters as well. Obviously, the abilities of the mentioned utility cannot be enough if you need a more thorough analysis of the received data. For instance, the administrator may need the statistics about the installed network interfaces of the device, the disks temperature and the vents work, the dynamics of the free disk space change, and so on and so forth. 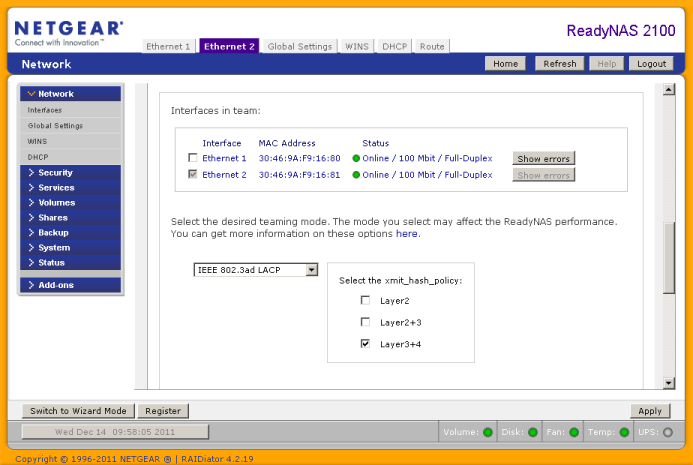 We have added NETGEAR ReadyNAS 2100 to our test system Cacti to get a utilization graph of all the interfaces in course of the storage configuration and testing. Of course, the information about ports utilization we could get from the switch that is connected to the storage, but all the rest data are missing there. Besides the centralized way of collecting information with the help of the server together with Cacti or some other products of this kind, there is an opportunity to collect it locally that will demand to install the appropriate add-on on the storage itself. 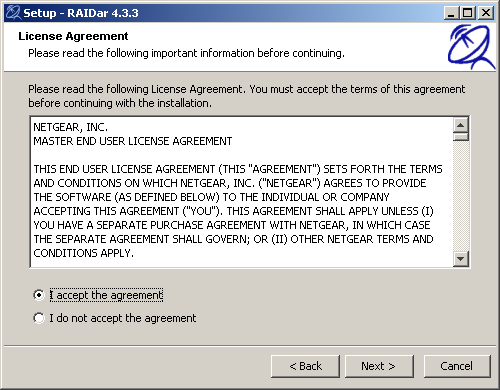 This process has no differences with the same procedure of other add-on installation. The only thing worth mentioning is MySQL that is crucial for the work of the installed module Cacti and it is not delivered with the module. 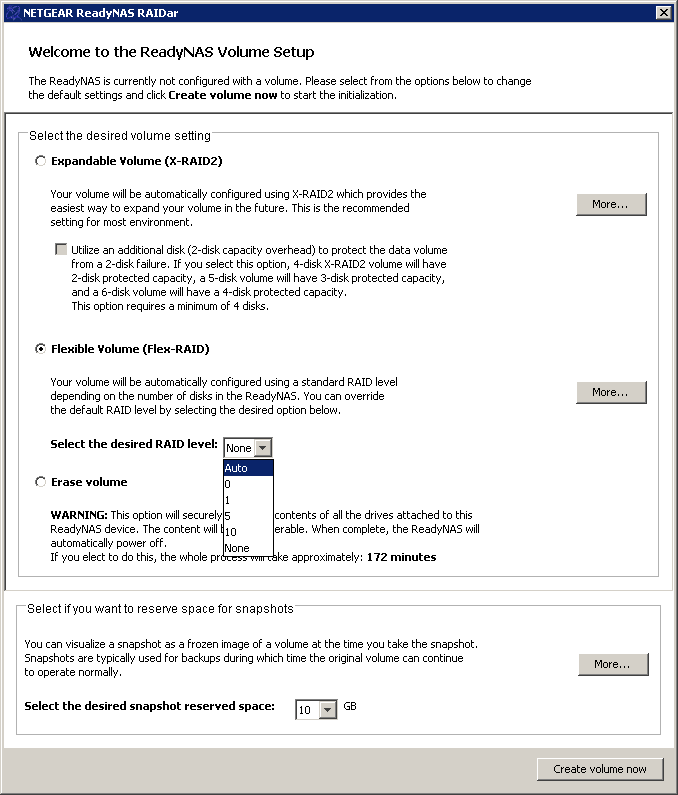 The database can be installed in another module – ReadyNAS Photos II. Along with the side products using SNMP, there can be used a NETGEAR original program product – NMS200, which has already been described earlier. With its help it's possible to monitor and to manage the NETGEAR devices. Now let's go to the testing section and have a look at the metrics of the storage. We traditionally start this section by estimating the device booting time under which we mean the time interval between switching power on and receiving the first echo-reply via ICMP. 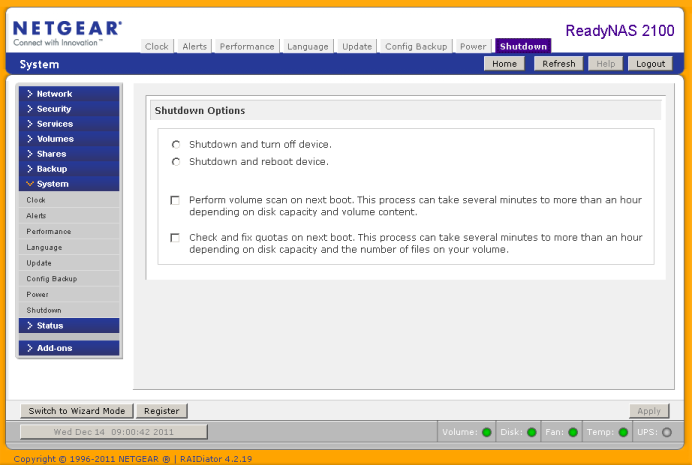 NETGEAR ReadyNAS 2100 load takes 100 seconds. We consider this result to be tolerable. The second test is devoted to the security check of the storage where we used a network security scanner Positive Technologies XSpider 7.7 (Demo build 3100). All in all there were ten open ports detected: TCP-80 (HTTP), TCP-111 (RPC Unix), UDP-111 (RPC Unix Portmapper), UDP-137 (NetBIOS Name), TCP-139 (NetBIOS Samba), TCP-443 (HTTP SSL), TCP-445 (Microsoft DS), TCP-548 (afpovertcp), tcp-3260 (iscsi-target), TCP-50000 (HTTP). The most interesting detected data are shown below. Now let's move to one of the mostly expected parts of our review – the efficiency tests of ReadyNAS 2100. This storage has two network interfaces that can be combined into a logical one for statistic increase of the device network part productivity. But our tests have been carried out without such a combination, as for the model's demonstrated speeds one GE interface was absolutely enough, though in some tests we came pretty close to its productivity. The main parameters of the test stand are given below. We used the utility Intel NASPT 1.7.1 in the test. It must be spotted that we deliberately decreased the RAM capacity available to this operating system to two Gbytes with the help of the msconfig utility. The first conducted test was the estimation of the access speeds to the storage via the SMB protocol. The results are presented on the diagram. 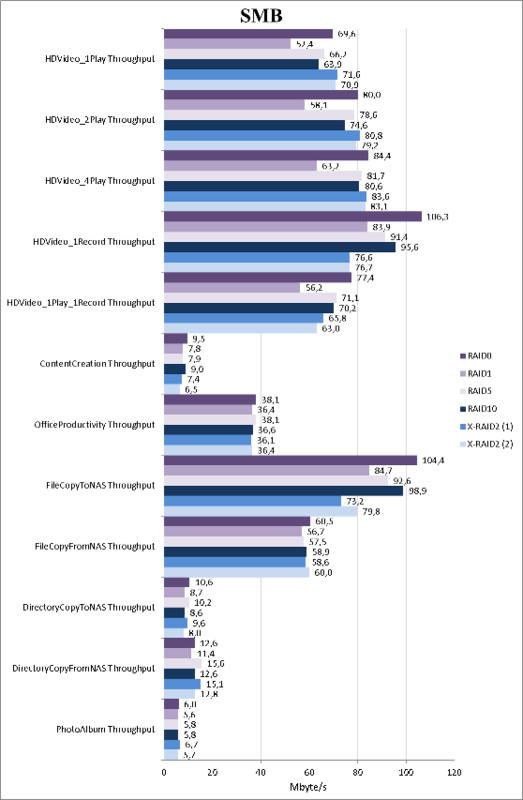 The X-RAID2 (1) and X-RAID2 (2) measurements were performed for the array X-RAID2 with protection from the breakdown of one and two disks correspondingly. 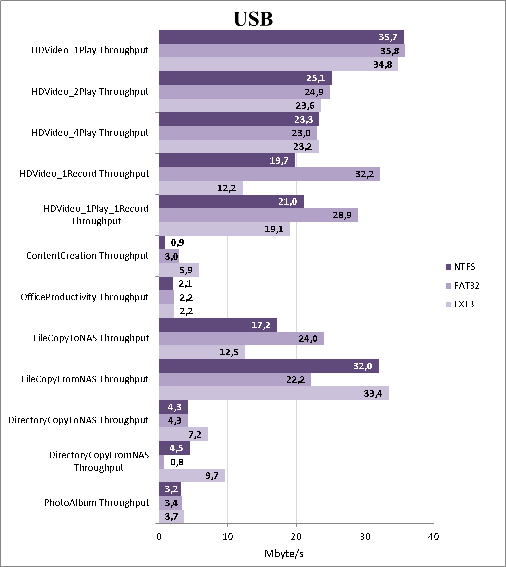 We were a bit surprised and perplexed by the efficiency of ReadyNAS 2100 in some tests like for example in the test PhotoAlbum Troughput where ReadyNAS 2100 showed the speeds that were less than those we estimated for the NETGEAR model ReadyNAS Ultra 2 Plus with two disks which we tested earlier. 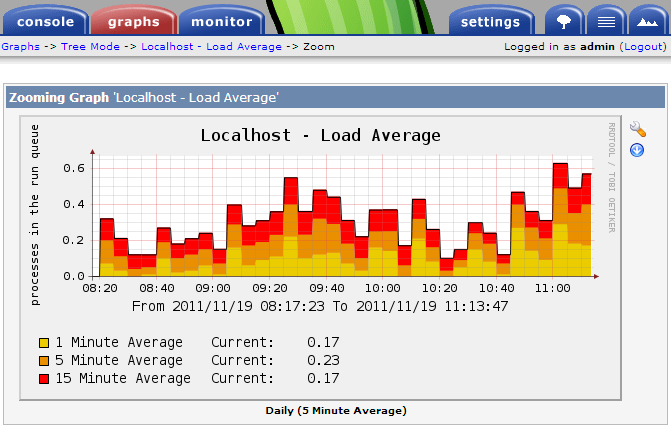 The rest of estimated speeds were quite predictable and normal for storages of this level. The next test was devoted to estimating the speeds of data transmission through the connection via the protocol iSCSI. We formatted the remote disk by means of two file systems: FAT32 and NTFS. The test results are shown below. We couldn't skip the storage support of the protocol IPv6. Such support will allow using NETGEAR ReadyNAS 2100 on the nets of the next generation when the switch of protocols from IPv4 to IPv6 is totally completed. Unfortunately, the use of IPv6 in the existing Windows operating systems is not so clear. For example, we failed to connect the remote device via iSCSI and the process of ReadyNAS 2100 connection can't be called cut and dry. Firstly, it is essential to configure the IPv6 address in the storage and the tested host. For the storage we chose fe80::1, whereas for the PC the address was fe80::2. For both of the sides we used the subnet prefix length equal to ten. Then the address of the storage had to be pointed out in the DNS or in some local file \Windows\System32\drivers\etc\hosts, but the note syntaxes for the resources IPv4 and IPv6 was a little different. For the least of them you must specify the interface identifier that can be gotten through the command netsh interface ipv6 show interface. For our NIC the ID is 28 that's why the note in the file hosts would look like fe80::1%28 test, where test is the name corresponding to the address fe80::1. After that it is needed to address the remote storage by name, typing \\test in the Explorer address bar. Now you can connect the remote files as local disks and move to the access speeds testing. On the diagram below you can see the comparison of the storage efficiency with the array RAID0 with the connection through the protocols IPv4 and IPv6. The efficiency of NETGEAR ReadyNAS 2100 during its work with the protocol IPv6 is a bit less than with the fourth version of the IP protocol. The tested storage has three USB 2.0 interfaces and we decided to connect the external hard drive Transcend StoreJet 25M3 with the volume of 750 Gbytes to the device to find out the access speed through the net by using three file systems: NTFS, FAT32 and EXT3. The received results are shown on the diagram below. 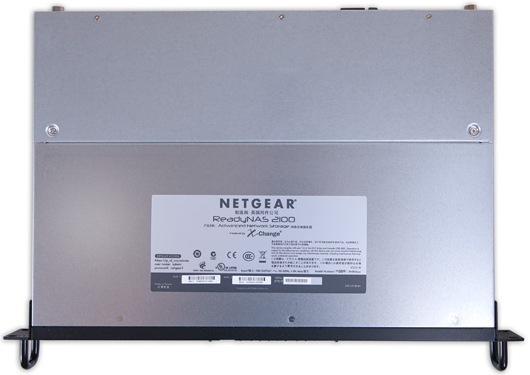 NETGEAR ReadyNAS 2100 allows grouping the interfaces to provide the fault-tolerant connection to the network and to balance the load. Here we must note that the results of our tests show that the weak point of the storage is not the network interfaces as the received speeds match the abilities of one Gigabit Ethernet link. To choose the variant of the interface aggregation is possible with the help of «Interfaces» section in the «Network» group of the web-interface menu. We connected both storage interfaces to one switch and started examining all the seven offered ways of grouping: Round-Robin, active backup, XOR, broadcasting, IEEE 802.3ad LACP, load balancing during transmission and adaptive load balancing. From these offered methods our switch Cisco Catalyst supports IEEE 802.3ad LACP, that's why we've chosen this one without any hesitations. It must be mentioned that the switch Cisco Catalyst 3750, that our storage was connected to, lets performing the balancing on the basis of MAC and IP-addresses only, while ReadyNAS 2100 can consider the information of the fourth (transport) level of the OSI model. We used the following configuration on the switch and the interface aggregating succeeded. That brings us to the end of the testing section. Let's make a conclusion. The tested model NETGEAR ReadyNAS 2100 is a NAS of the initial level suitable for work in small offices and the department maintenance, it is rack mountable. We didn't expect any staggering results from this model, but the demonstrated speeds, in our opinion, are generally bearable for the devices of such class. Though we didn't manage to get the value more than 1 Gbps, in some tests we came close to it. The affordable price makes NETGEAR ReadyNAS 2100 a good choice in the situations when a cheap NAS is needed and the speeds less than 1 Gbps will be enough. Here are the advantages of the device enumerated. But unfortunately we can't help mentioning the drawbacks as well. At the moment of creating this article an average price of NETGEAR ReadyNAS 2100 (RNRX4410) in on-line shops in Moscow was 65000 rub.